DESCRIPTION FROM THE PUBLISHER: Welcome planet explorers! Did you know that Venus is covered in volcanoes? Have you ever wondered why Mars is red? Well, you’re in luck! 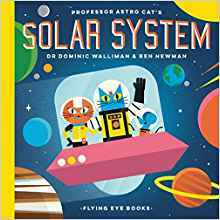 Professor Astro Cat and the gang are about to set off on a journey around our solar system–so buckle up, join the tour, and get your learn on! This book is part of a series of space books featuring Professor Astro Cat.